The large northern island of Hokkaido is famous for many agricultural products including kombu, potatoes, dairy products and its rich seafood including salmon and crab. Potatoes are represented here with croquettes, dairy with soft cream cones and the trendy salted caramels and the seafood selection changes seasonally. Here you will find some Japanese wine made in Hokkaido. Hokkaido’s climate is ideal for growing grapes as it stays much drier than the rest of Japan. Also, the cool evenings allow the grapes to ripen slowly giving the wines a nice, natural acidity. German varietals, especially a steely Kerner, does well in Hokkaido. And, it is also known for its unique fruit wines, look for strawberry, sweet melon (think cantaloupe), or pear. I’ve been drinking the strawberry Hokkaido wine for over twenty years. One of my Japanese aunt’s does not drink a lot, and she likes these as they are light in alcohol, sweet, and fruity. 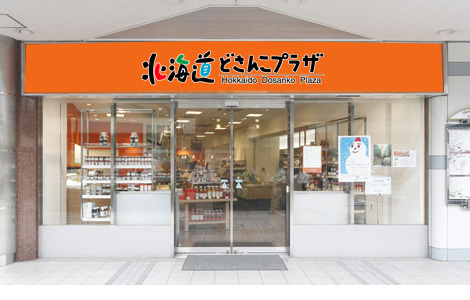 The Hokkaido Dosanko Plaza is conveniently located in the same building with a few antenna shops so worth a visit if you have time and are curious about regional foods. My Fiance’ and I want to go….